ATK Audiotek has selected JBL Professional’s VTX A12 and A8 line array speakers to deliver premium live sound reinforcement for upcoming primetime events, including the Super Bowl Halftime Show, the Grammy Music Awards Ceremony and the Screen Actors Guild Award Show. ATK Audiotek specialises in providing audio systems for live television shows and major events like The Voice, Jimmy Kimmy Live!, the Super Bowl, the Grammy Awards and more. They also have a thriving integration business, and install audio systems for some of the world’s leading tech and retail companies. 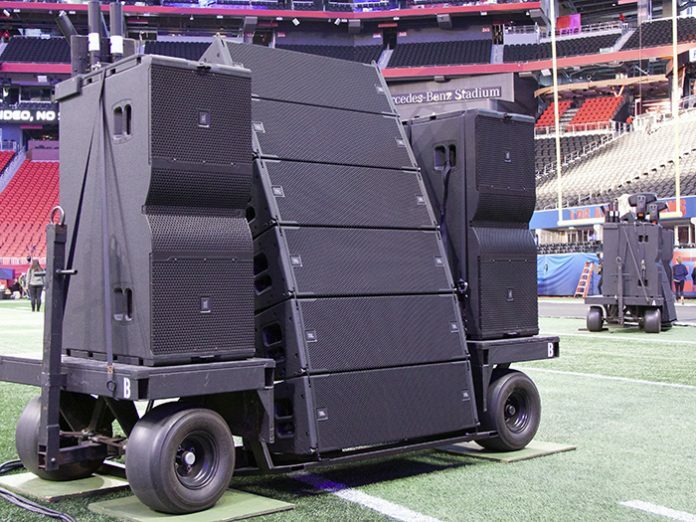 In order to raise the bar from previous successful Super Bowl and Grammy Awards shows, ATK plans to deliver premium audio quality at these upcoming major events with industry-leading JBL VTX Series A12 and A8 line array speakers. ATK recently supplied a VTX A8-based sound reinforcement system for the Screen Actors Guild Awards, which took place on January 29 at the intimate Shrine Auditorium. The A8’s ultra-compact design and exceptionally flat response helped the ATK team deliver superior clarity and coverage, providing maximum gain-before- feedback in the acoustically-challenging ballroom.